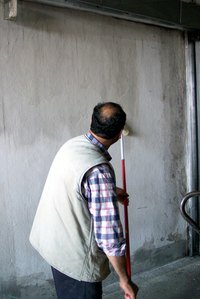 Painting interior concrete walls can add warmth to a basement at very little cost. Because concrete is porous, it absorbs a lot of paint. Unless you're an experienced painter, you may want to purchase extra paint to account for more absorption than usual. When selecting a paint, remember that there are masonry paints that are designed to reduce mold and mildew growth and resist water. This can be helpful in a basement, where water damage can occur. Fix any cracks with a concrete crack injection kit. Let dry thoroughly. Wash the wall with TSP and let dry thoroughly. Check to see if the concrete has been sealed. Place a piece of plastic food wrap on the surface and leave it for 24 hours. If the concrete has not been sealed, there will be condensation on the plastic wrap. Apply a sealer to the surface if necessary. This will help keep the concrete water-resistant. Apply a coat of masonry primer. If the wall is old, you may skip this step. However, primer is less expensive than paint, so if you apply the primer first, you'll get better coverage with the more expensive paint. Also it will be more water-resistant, which will help the paint last longer. Apply the paint to the wall. It will probably take more than one coat to get suitable coverage, and a few thin coats leave a stronger surface than one thin coat. If your basement is unfinished, consider spraying the paint on. Rolling or brushing it on, while not difficult, will take much longer.